Last night the long drought from the last out of the World Series in October, to the first pitch of the 2014 Major League Baseball season came to an end. 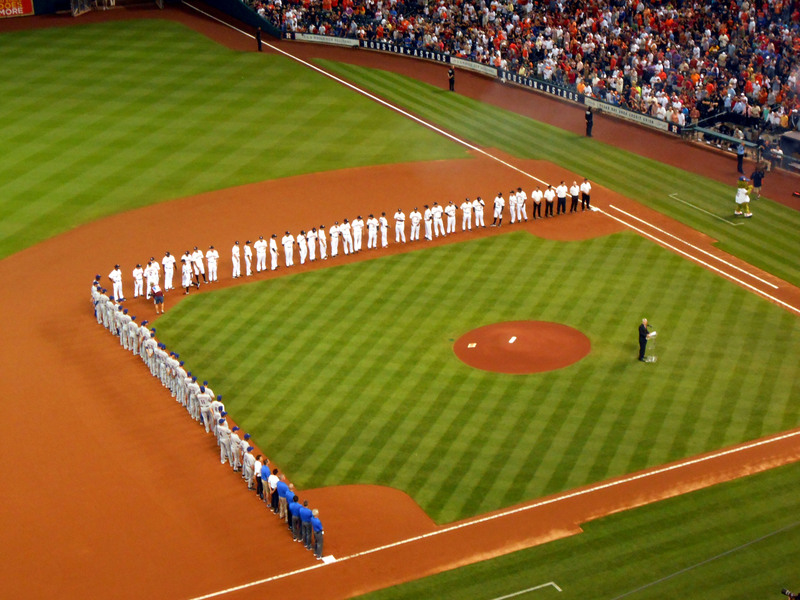 The evening was filled with all of the typical prime-time opening night festivities that one comes to expect from the National Pastime and helped usher in the next six months of the sporting calendar. Technically the start of the 2014 Major League Baseball season occurred in Australia during a two-game series Down Under between the Arizona Diamondbacks and the Los Angeles Dodgers, but in my mind one cannot really count those games as the start of the season since the other 28 teams were still playing Spring Training ball. 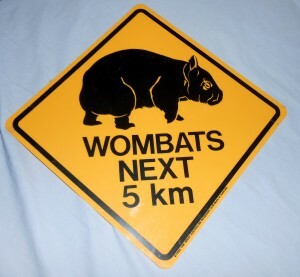 Australia is a great place to see wombats but is not not the best place to host regular season baseball games in the middle of Spring Training. In fact even the Dodgers and Diamondbacks returned to playing Spring Training games once their trip to Australia was complete. I know that MLB puts signature series games in exotic locales around the globe each year as a way to build the fan base outside of North America. I also know that the idea of playing games in a converted cricket stadium that was built before the United States Civil War is certainly a unique venue that is hard to pass up. And despite the time difference that made catching both games stateside difficult from what I saw the fans in Australia seemed to enjoy the Major League Baseball experience. And if some children in the stands grow up to be lifelong fans of baseball, or perhaps even turn into Major League players, like Tampa Bay Rays pitcher and Australia native Grant Balfour, then the money spent taking the game to Sydney will be worth it. 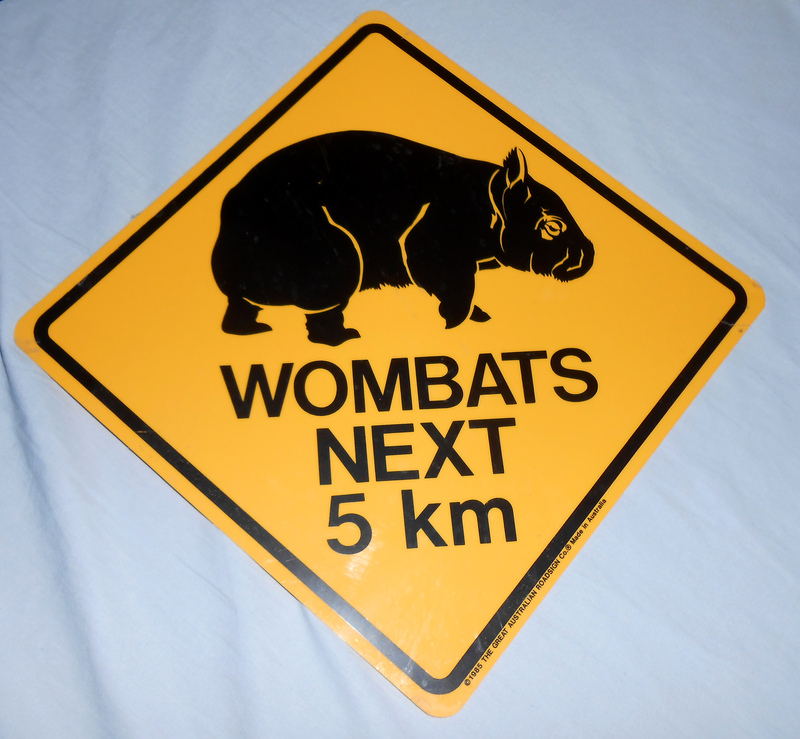 I was fortunate enough to travel to Australia a few years back and it is certainly a lovely place to visit as it is full of wonderful historical venues and culture. But, due to it being located on the other side of the globe it is perhaps not the best venue for hosting regular season baseball games in the middle of Spring Training since it could put the teams playing in them at a disadvantage. I am all for increasing the global reach of baseball and think that games should be played around the globe. I also firmly believe that baseball should once again be played at the Summer Olympic Games so I am not saying that North America should be the only area where Major League Baseball is played. But, for the good of the game I think that those games that are played each year in exotic locales should count as Spring Training games and not regular season games. Under this plan the fans in those far off countries would still have the chance to see Major League Baseball games in person but the players would not be at the disadvantage of already playing games that count in the middle of Spring Training. Opening nights in baseball such as the one last year between the Houston Astros and the Texas Rangers often feature large flags. So, in my mind the real start of the season was last night between the Dodgers (winners of those two games in Australia) and the San Diego Padres. Starting the year between two teams from the same state is nothing new for MLB. 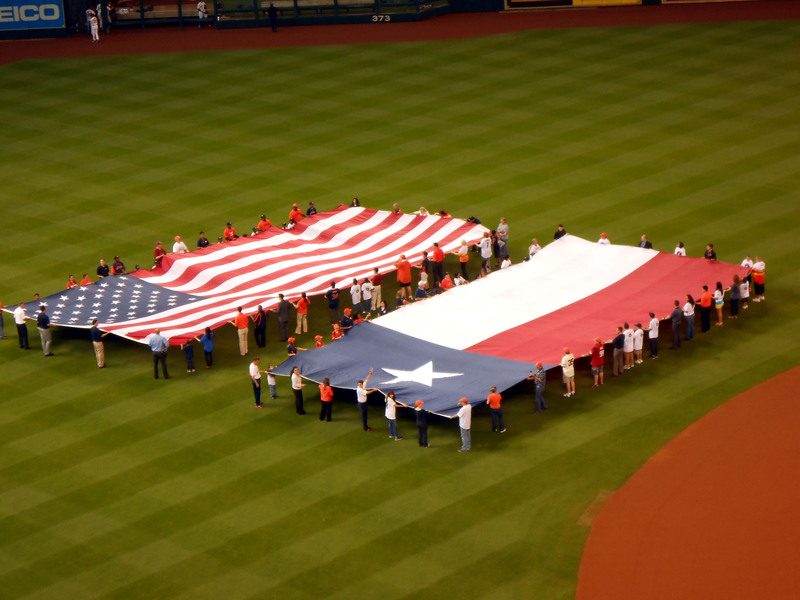 Last year the prime time opener had a bit of Texas twang to it when the newly minted American League Houston Astros hosted their in-state and new division foes the Texas Rangers. The Astros won the season opener last year against the Rangers and then proceeded to take a season long dive that would make a Grecian free diver proud. Before that first pitch of the prime time opener each year there is the promise of a season full of potential. A single game, win or lose, certainly does not make a season. Winning the season opener in front of a prime time audience does not guarantee smooth sailing throughout the rest of the season anymore than losing the opener means that the season will be a complete waste. While all eyes were on the Dodgers and the Padres last night, the other 28 teams will start play today and tomorrow as they each drive towards the goal of a World Series title. There will be individual story lines to follow this year such as Derek Jeter’s final season as a player and Ryan Braun’s return from being suspended last year for Performance Enhancing Drug use. 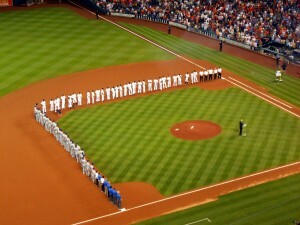 One of the highlights of opening night is when the players from both teams are introduced and line the infield before the game. There will be larger stories to look at as well this season such as the role that expanded instant replay will have on the results of games in addition to what teams will exceed the preseason predictions and make a push for the playoffs. The MLB season will be six months of endless possibilities that will allow fans of all ages to take in the sites and the sounds of the game just as they have for generations. Sure, starting the season with a pair of games in a cricket stadium surrounded by wombats, koalas and kangaroos can be cool now and then but for me there is nothing like the appeal of multiple games every night back in the 30 Ballparks of Major League Baseball. The cold days of winter are behind us for the most part and the Boys of Summer are ready to hit the ground swinging. And if one of those Boys of Summer happens to hit the bull they just might win a steak dinner. Now if you’ll excuse me, I need to decide which games to watch tonight. Play Ball! The other day USA Today announced the results of a poll of Top 10 Spring Training Ballparks as voted by their readers. Lists like this are often subjective in nature and one could make arguments that what makes one Ballpark better than another one is in the eye of the beholder with everyone looking for something a little different in terms of what makes a good Ballpark. While some people might look for a Ballpark that has more amenities such as luxury suites, others might look for a Ballpark that feels like it belongs back in the Golden Age of baseball. With that caveat in place, I tend to mostly agree with the results of the poll. 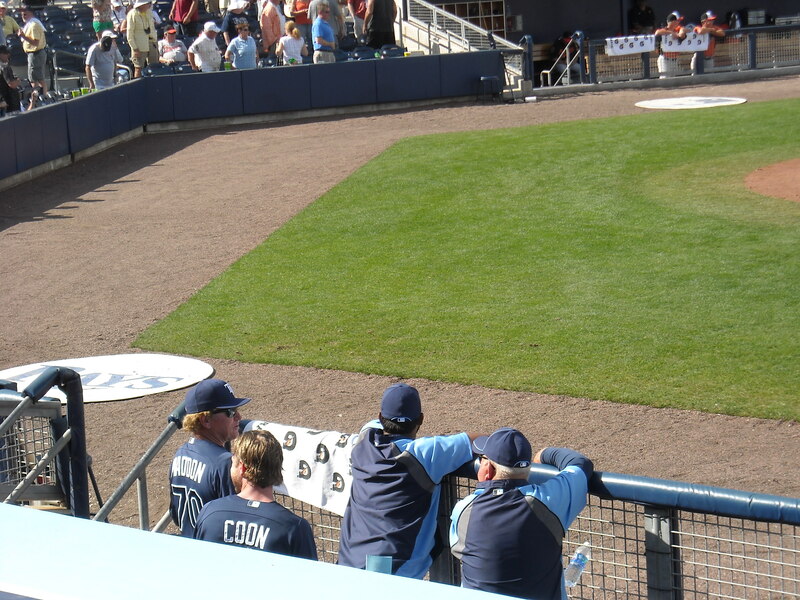 The readers of USA Today recently crowned Charlotte Sports Park, Spring Training home of the Tampa Ray Rays, as the best place to watch Spring Training. 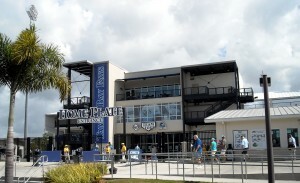 While there seems to be a yearly campaign of complaining about their regular season home, Tropicana Field, The Tampa Bay Rays garnered the top spot with their Spring Training Home the Charlotte Sports Park, in Port Charlotte, Florida. I visited Charlotte Sports Park a few years back and definitely found it to be a very nice complex and one that I definitely hope to return to many times. For the record I also tend to think that Tropicana Field is a very suitable Ballpark for baseball and am growing tired of the yearly whining about how out of date it is and how much it needs to be replaced. Charlotte Sports Park underwent a $27,000,000 renovation in 2009 and is utilized by the Class-A Charlotte Stone Crabs of the Florida State League at the conclusion of Spring Training which allows for nearly year round use of the complex. With great seats located all around the Ballpark there really are no bad seats to see the Rays in action. Aside from the bragging rights of having the favorite Ballpark the Rays also boast one of the shortest commutes between Spring Training home and regular season home with a drive of about 90 minutes between St. Petersburg and Port Charlotte. The Arizona Diamondbacks and Miami Marlins are the other teams who spend the Spring and regular season based in the same state and also enjoy short commutes for their fans. Of course the Tampa Bay Rays once had a much shorter Spring Training commute when they spent the entire year in St. Petersburg, FL splitting time between Al Lang Stadium and Tropicana Field a few miles down the road. The full Top 10 list features only three Ballparks from Arizona’s Cactus League showing that most people surveyed prefer their Spring Training baseball in the Grapefruit League under the Florida sun. A boardwalk stretches across the outfield at Charlotte Sports Park and ensure easy walking from one end of the facility to the other. While I cannot speak for the Cactus League Ballparks on the list I do have extensive bleacher and box seat time in the Grapefruit League so I feel pretty confident in commenting on those facilities. 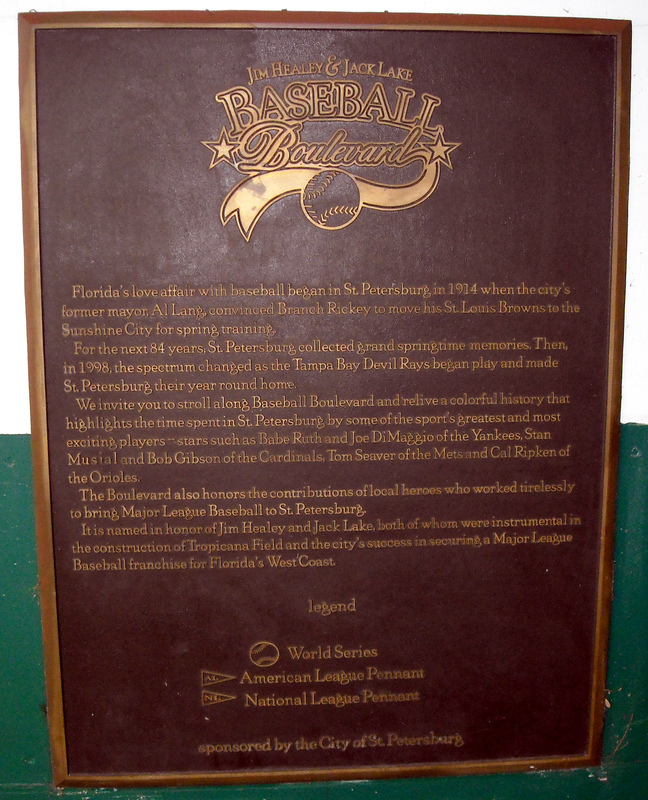 The oldest Ballpark still in use, McKechnie Field, in Bradenton, FL is the long-time home of the Pittsburgh Pirates and ranked fourth on the list. For historical factors alone I would have moved it up into the top 3 but I suppose fourth place is not too bad considering it comes in as the second Grapefruit League Ballpark. Ed Smith Stadium, or Birdland South as it is called by some Oriole fans, had a strong show of support from the readers in the poll. 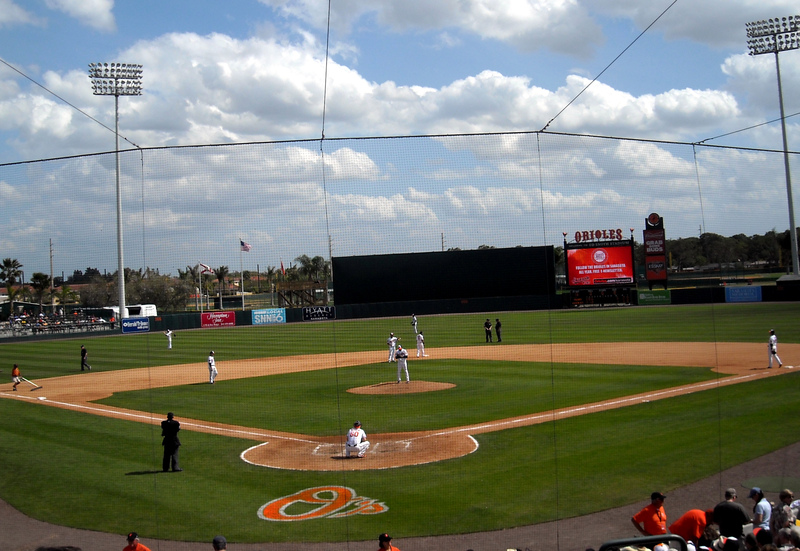 As far as fifth and sixth place go I would swap the Philadelphia Phillies’ Clearwater based Ballpark, Bright House Field with the Baltimore Orioles’ Sarasota home at Ed Smith Stadium. In full disclosure I have only driven by Bright House Field so perhaps it is nicer on the inside than a quick glance down the highway shows but for my money it is hard to beat the old Ballpark charm of Ed Smith Stadium. Ed Smith Stadium also features an air conditioned restaurant which allows fans a chance at a sit down meal before heading back to catch the action on the field. 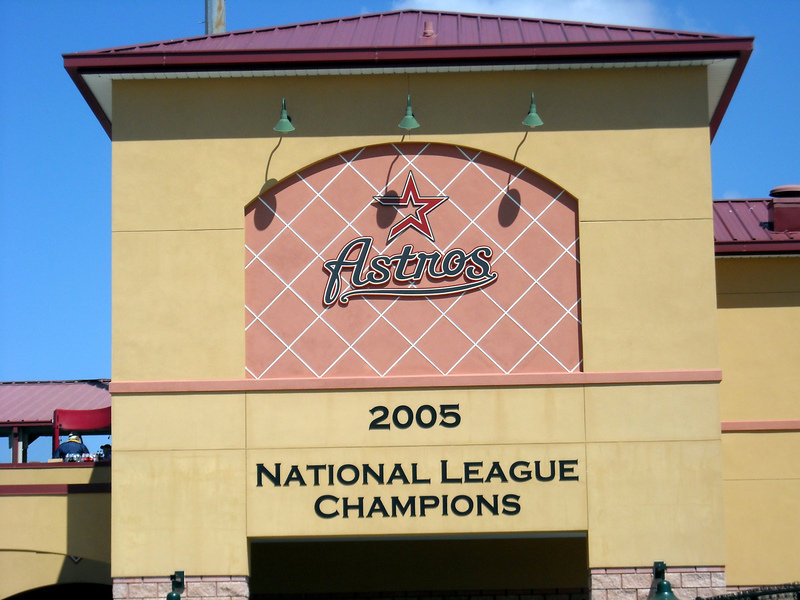 Coming in at number 10, Osceola County Stadium may soon be without a Spring Training tenant as the Houston Astros consider replacing the Ballpark they have called home since 1985. The 10th ranked Ballpark on the list is in danger of no longer hosting Spring Training games in a couple of years. 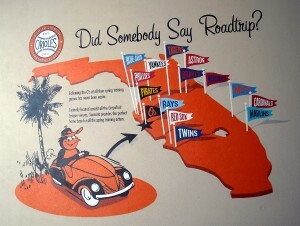 With the Houston Astros exploring locations in West Palm Beach, FL their days at Osceola County Stadium seem numbered. It will be a shame if the Astros leave the Spring Training home they have had since 1985 for greener pastures since according to the pollsters the fields of Kissimmee, FL are already pretty green. Granted Osceola County Stadium is an older facility but with older Ballparks making the Top 10 it shows that older is sometimes better in the eyes of the ticket buying fans. For completeness the entire Top 10 Spring Training facilities, according to the readers of USA Today, is included below along with the Major League Baseball teams that call them home. Ballparks I have visited are listed in bold. Ballparks with an asterisk beside them are among the Ballparks I plan to visit next March. 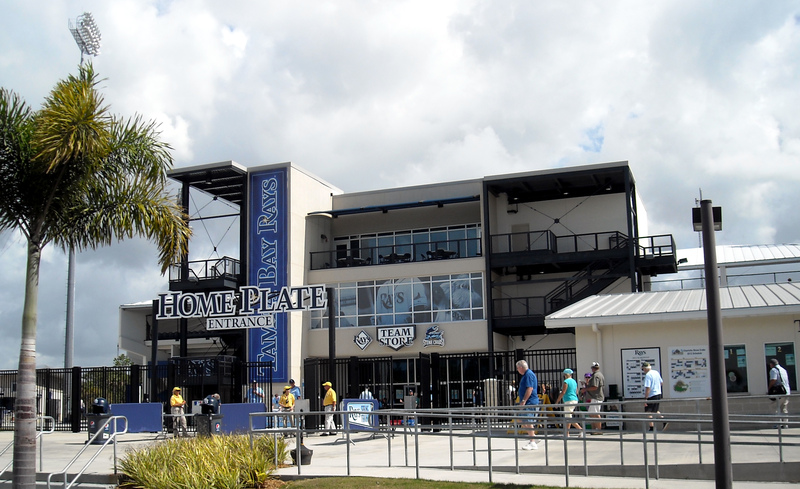 Half of the 30 Major League Baseball teams call the Grapefruit League their home for the spring and based on the results of the poll seven of the 10 best Ballparks also call Florida home. 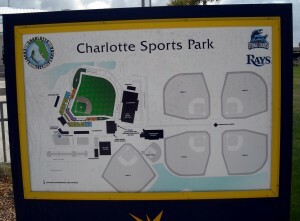 Charlotte Sports Park – Port Charlotte, Fla. Home of the Tampa Bay Rays. Goodyear Ballpark – Goodyear, Ariz. Home of the Cleveland Indians and the Cincinnati Reds. Salt River Fields – Scottsdale, Ariz. Home of the Arizona Diamondbacks and Colorado Rockies. 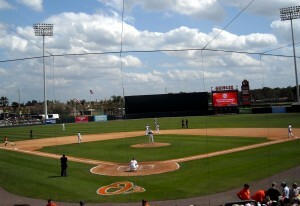 Ed Smith Stadium – Sarasota, Fla. Home of the Baltimore Orioles. 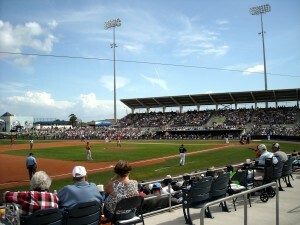 Tradition Field – Port St. Lucie, Fla. Home of the New York Mets. Cubs Park – Mesa, Ariz. Home of the Chicago Cubs. 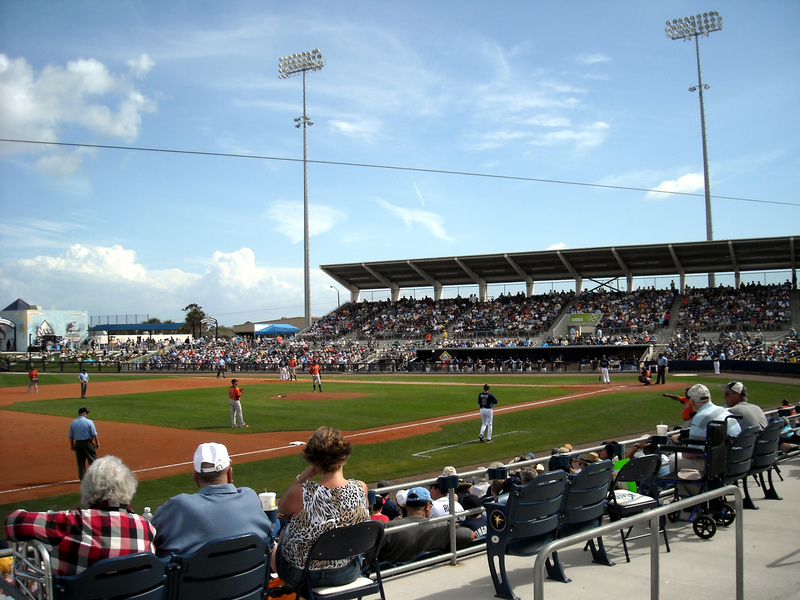 JetBlue Park – Fort Myers, Fla. Home of the Boston Red Sox. 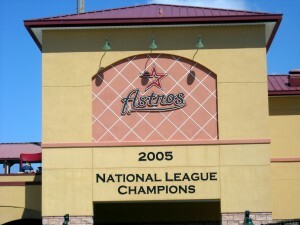 Osceola County Stadium – Kissimmee, Fla. Home of the Houston Astros. Now if you’ll excuse me, I have some trips to some ballparks to plan. This past weekend around 160,000 gallons of crude oil spilled into Galveston Bay following a collision between two ships. High waves driven by wind made containing the spill impossible and oil reached some areas on shore and also lead to the closure of the Houston Ship Channel during the early phases of the cleanup effort. Besides the container ships and tankers that were left waiting for the Ship Channel to reopen passengers aboard two cruise ships were delayed and the ferry linking Galveston Island and the Bolivar Peninsula was closed as a result of the spill. While 160,000 gallons of oil sounds like a lot of oil it is a mere drop in the bucket compared to some of the worst oil spills in history. Pelicans like this one are especially susceptible to oil spills. Still, even a drop in the bucket can have long reaching implications. And when that drop of oil in the bucket occurs during prime bird migration season the sticky situation can be even worse. Oil covered birds have already been discovered and there will likely be more found before the clean up is complete but there is more to the impacts of the spill then some oil covered birds and fish. Impacts of crude oil will likely be felt all the way to the bottom of the food chain with the total impacts not known for years. Few would argue that oil is an important part of life and is needed for everything from transportation to power generation and it is not realistic to say that society needs to be completely oil free. Effects of oil spills are often felt all the way to the bottom of marine ecosystems which means finding the total impact can often take decades. While there are alternative energy sources such as wind and solar power that can help reduce the amount of petroleum products society needs the simple fact is the industrialized world cannot function without fossil fuels. As such every possible precaution is taken to ensure the safe manufacturing and transporting of oil from the time it leaves the ground until the final product is placed in the consumer’s hand. Despite all of these precautions there are occasionally spills and other accidents such as the one that occurred over the weekend. When things do go wrong in the oil manufacturing process and entire ecosystems are put at risk it becomes time to look at all sides of the argument and ensure that impacts are minimized and the oil is removed in the safest way possible. 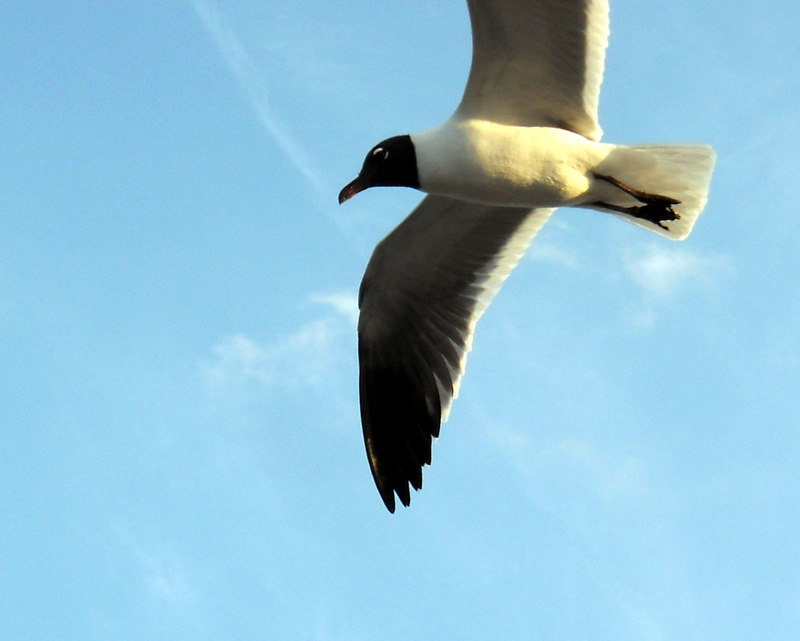 Birds that land in oil require quick attention to prevent lasting effects and death. We are approaching the fourth anniversary of the Deepwater Horizon incident where the Gulf of Mexico was inundated over 87 days with an estimated total discharge at 4.9 million barrels of oil, which is roughly 210 million gallons. The 2010 spill, which is also referred to as the BP Oil Spill, was the largest oil spill to occur in the waters off of the United States. 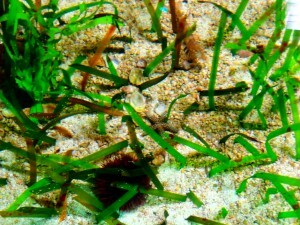 Even now many groups are monitoring the Gulf of Mexico for signs of damage to the ecosystem. While trends such as a rise in dolphin fatality rates have been observed the total impacts related to the spill will not be known for decades. It should be noted that there are ships and other modes or transport that travel safely through the waters and roads on a daily basis so oil spills are certainly the exception more than the rule but it is an exception with dire consequences. 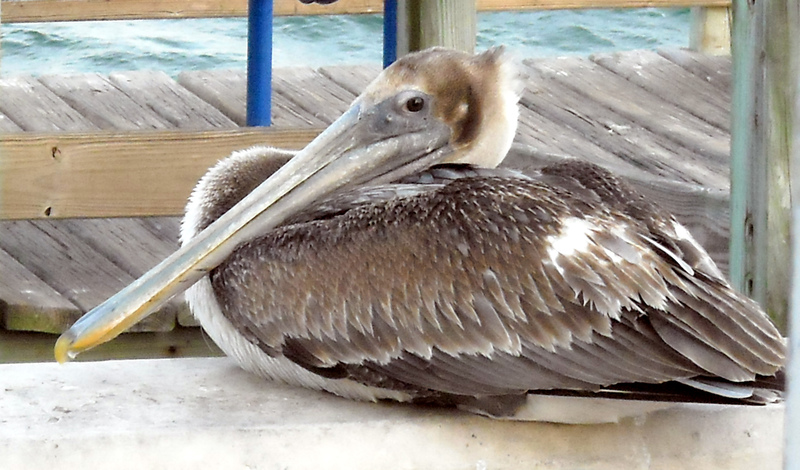 Oil runs the boats in the marina and under most circumstances can coexist with marine life unless it it spilled directly into the environment such as was the case recently in Galveston Bay. The same is true of Galveston Bay which has large recreational and professional fishing communities that count on the wildlife within its waters to be free of contaminants and safe to eat. 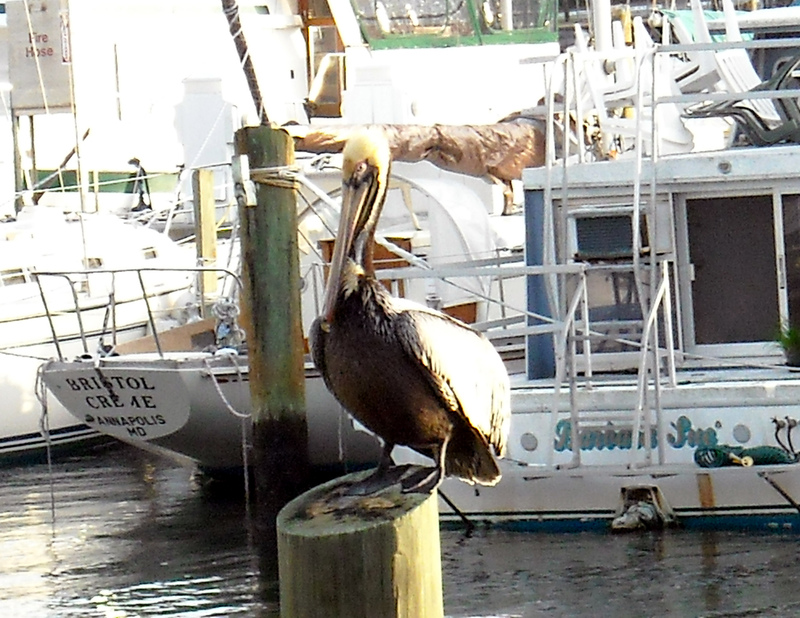 There is certainly more to life than a stroll on the beach or a quiet day out on the fishing pier. But everybody deserves the option to stroll on that beach and fish from that pier oil free when the time to does come. Now if you’ll excuse me, all of this talk about marine ecosystems has me craving some scallops with Old Bay Seasoning. A couple weeks back I spent a week carpooling with English actor Tom Baker. Baker, best known as the fourth actor to portray the “doctor” on Doctor Who, was a very entertaining passenger and made my time in the car go by very quickly. Okay, in fairness Baker was there in CD form narrating a Doctor Who story but it was still a very entertaining week and certainly felt like he was right there in the car with me. The week started at a local used book store by my house which happened to have a rather impressive Doctor Who display. 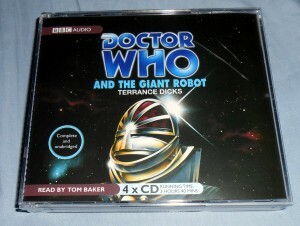 Among the books and other Whovian wares were some audio CD’s of various episodes. 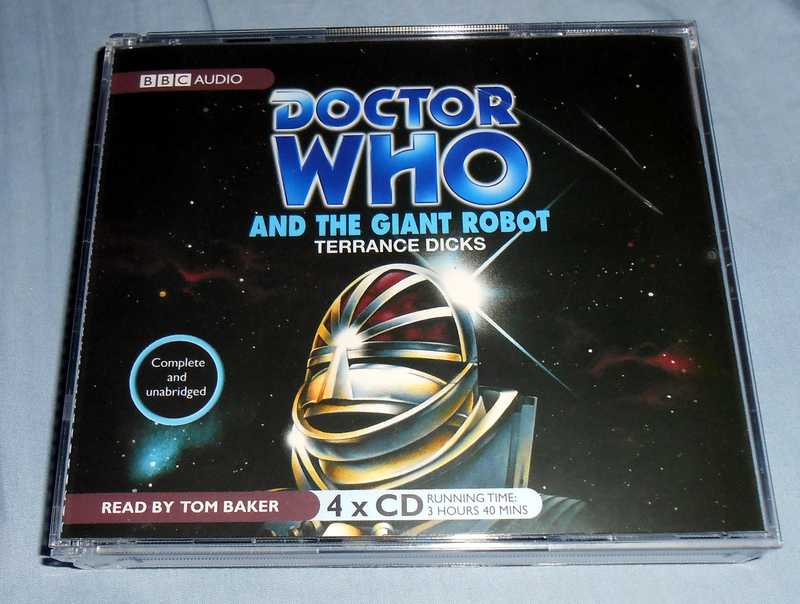 Tom Baker provided the soundtrack for a week during my commute with his dramatic reading of a classic Doctor Who story. Usually I prefer my books to be in page turning paper form which is why I am slow to adopt the E-reader craze. But the idea of audio books has often intrigued me since it adds a certain performance element to the tale. There is a certain appeal to an audio only performance that harkens back to the old radio serial days when listeners had to paint the pictures in their minds without the aid of a television picture showing them what was happening. Often times a radio broadcast of a sporting event will be much more vivid than the television counterpart as well. 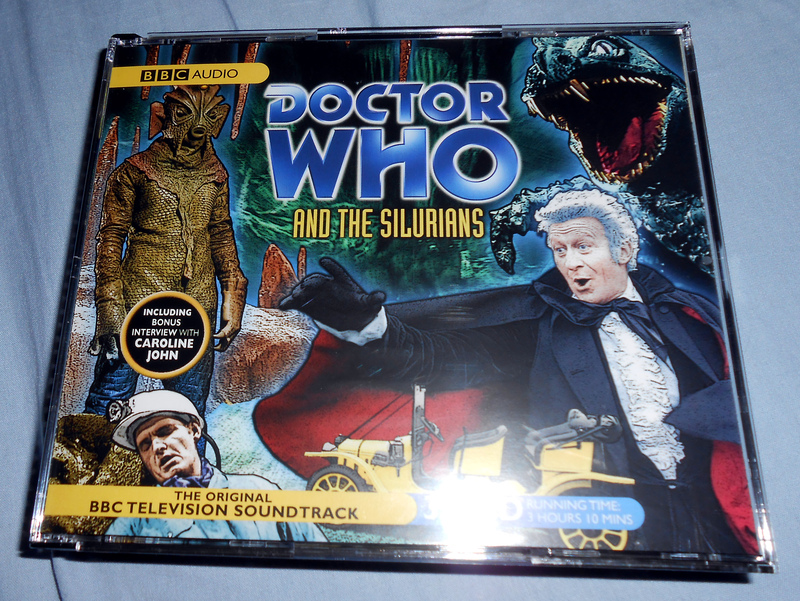 So as I was looking at the selection of audio Who, one episode in particular caught my eye because it was narrated by the Doctor himself. Tom Baker was the first Doctor I ever recall watching. And while I have also enjoyed David Tennant and Matt Smith as the Doctor there is just something that always seems to draw me back to the Tom Baker stories. The same thing happens in the James Bond world with Roger Moore. While I enjoy movies from each of the actors who portrayed Bond, James Bond, it is the Roger Moore movies that were my first exposure to the franchise and tend to be the ones that are the most enjoyable. While not as exciting as the Tom Baker version I was able to take care of some commute withdrawal symptoms with another classic Doctor Who story. With it being well established that Tom Baker as the Doctor holds a special place in my Whovian heart I figured what could be better than having him take a car ride with me? The episode was three hours spaced out over four CD’s and it took me a week to get through them despite having the CD running every time I was in the car. Of course the sum of my driving during the week would be about 20 miles a day so there really was not a lot of time in the car on a daily basis which helped stretch out the story. Now I know that there are many people reading this who have a commute that would allow them to listen to a three-hour story in a couple of days but I have been fortunate to have short commutes for most of my professional life. Each time I drive to Minute Maid Park and see the southbound cars at a rush hour standstill I am thankful that I am not one of those cars trapped in the bumper to bumper traffic. Of course if I were ever forced to be one of those commuting cars I can always take Tom Baker along with me and I am sure that the ride would seem to go just a little bit faster. When the day finally came when the end of the story was reached I found myself going through serious withdrawal as my car transitioned from the adventures of the Doctor back to the sounds of music and sports radio. I knew that my commute with Tom Baker would be finite but I guess I did not know how much I would miss that long scarf wearing thespian. I went back to the book store to see if perhaps there was another Tom Baker episode that I had missed the first time I was there. 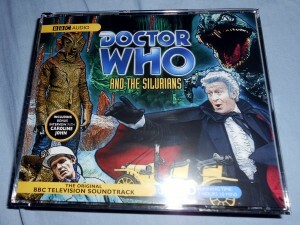 While I did not find any more Tom Baker I did find another Doctor Who episode that helped me stay calm and carry one for a few more days until the time when the commute will be filled with the sounds of Major League Baseball once again. Now if you’ll excuse me, I am off to the book store to see who I can “commute” with next. A couple of weeks ago the city of St. Petersburg, FL celebrated the 100th anniversary of Spring Training baseball within its borders with a ceremony at Al Lang Stadium that included the daughter of Babe Ruth. Ruth was a rookie in 1914 but spent many spring days on the fields in and around St. Petersburg and was instrumental in helping build the popularity of Spring Training. 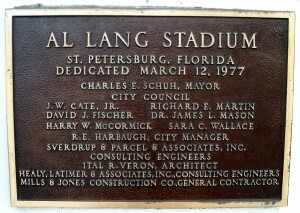 Al Lang Stadium in St. Petersburg, FL is named after the former mayor who helped make Florida a Spring Training destination for over 100 years. When Spring Training first came to the sun soaked shores of Florida things were much different than the Florida of today. In the pre Walt Disney World days trains were still the main mode of long distance travel. In fact many railroad barons made their fortunes with running rails from one end of the state to the other. It was those very same rails that teams would take down from their home stadium to the spring training sight for a couple of months before the grind of the season started. St. Petersburg, FL recently honored the 100th anniversary of Spring Training in Florida with a ceremony featuring Babe Ruth’s daughter. To be fair Spring Training in Florida actually started in Jacksonville with the Philadelphia Athletics in 1913 but once teams started finding the Tampa/St. Petersburg region things really started to take off and ultimately led to the Grapefruit League with allowed for teams to play against each other as the spring rolled along. While Florida was once the home to all of Spring Training today teams are equally divided between Florida and Arizona with 15 Grapefruit League teams and 15 Cactus League teams. While I selfishly would love to see all teams still train in Florida I know that having teams train closer to their fans in Arizona is a good thing to allow them the experience of Spring Training. Most of the old ballparks from the early years of Spring Training are no longer used or are hanging on by a thread. I have already written extensively on the uphill battle, Tinker Field, the longtime Spring Training home of the Washington Senators and Minnesota Twins has in its bid to avoid the wrecking ball. 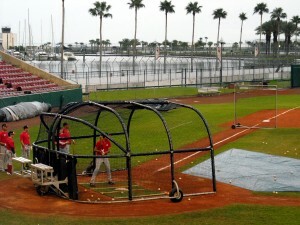 Team Canada has been a frequent visitor to Al Lang Stadium in recent years and is keeping the tradition of baseball alive. 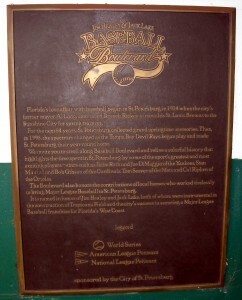 Dodgertown in Vero Beach, FL sits vacant for the fifth year in a row. Built on the site of a former Naval base, Dodgertown was home to the Brooklyn Dodgers from 1953 until the Los Angeles Dodgers left town in 2008. While the Dodgers spent 53 years in Vero Beach, the Detroit Tigers have spent 78 years overall in Lakeland and 49 spring seasons at Joker Marchant Stadium. 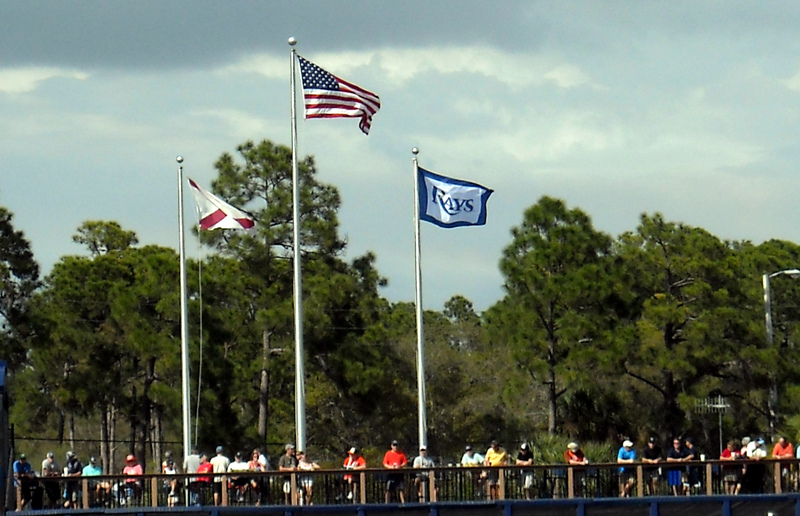 The Tigers relationship with Lakeland is the longest partnership between a ballclub and a single city for Spring Training. 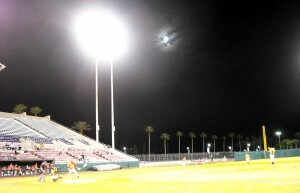 While the Tigers have the longevity record for a team and a city, McKechnie Field in Bradenton, FL is the oldest Ballpark still hosting Spring Training in Florida. The Ballpark, built in 1923, has been renovated extensively through the years to keep up with the ever changing needs of Spring Training. While the St. Louis Cardinals were the first team to call it home, the Pittsburgh Pirates have spent every spring since 1969 at McKechnie Field. The Pirates also have a Single A affiliate the Bradenton Marauders based at McKechnie Field. 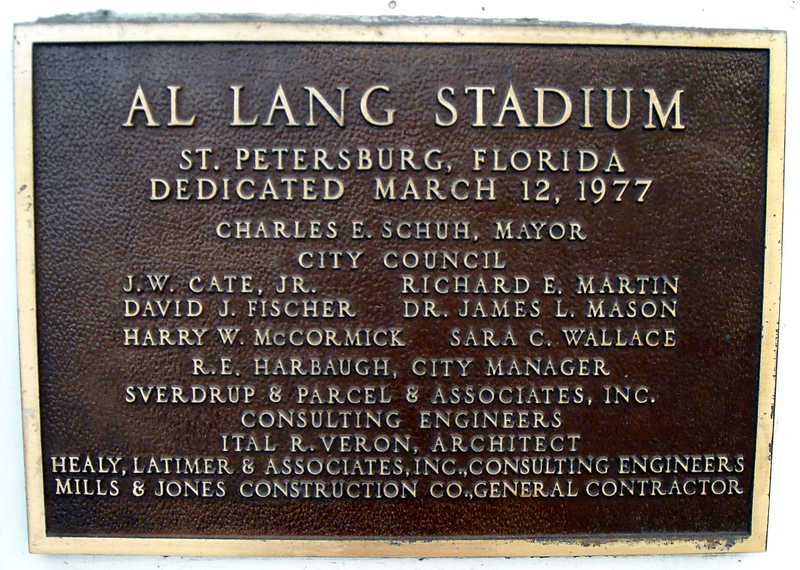 As for Al Lang Field, the Ballpark hosts a few games here and there but has not had a regular team call it home for Spring Training since the Tampa Bay Rays moved to Port Charlotte in 2008. Al Lang Stadium has not had a regular team call it home for Spring Training since the Tampa Bay Rays moved to Port Charlotte in 2008. Instead, “the other house that Ruth built” has served as the home pitch for the Tampa Bay Rowdies soccer club of the North American Soccer League as well as serving as a hospitality area for the Grand Prix of St. Petersburg. With teams moving to bigger and newer Ballparks it is doubtful that Al Lang Field will ever host Spring Training games on a regular basis beyond the International games it hosts each year. So with the look back on a century of baseball in St. Petersburg it is only fair to look at what other events were happening in 1914. The year started with the first scheduled airline flight from the World’s first airline, St Petersburg Tampa Airboat Line, which occurred between St Petersburg and Tampa. Henry Ford introduced an assembly line for the Model T which forever changed the way cars and many other items were built. Every night is a good night at the Ballpark and for 100 years Spring Training has been a fixture of the Florida night life. The first stone of the Lincoln Memorial was put into place in 1914 which was the 49th anniversary of Abraham Lincoln’s assassination. The Greyhound Bus Company started operations in Minnesota and a patent was issued for the air conditioner. Honus Wagner becomes the second baseball player to get 3,000 hits. Franz Ferdinand, Archduke of Austria and his wife Sophie were assassinated in Sarajevo which becomes the catalyst for the start of World War I. The Boston Red Sox purchased the contract of Babe Ruth from the Baltimore Orioles after the Philadelphia Athletics turn down the offer. Ruth would soon leave the Red Sox for the Yankees and the rest as they say is history. Speaking of those New York Yankees, they received new owners in 1914 when Colonel Jacob Ruppert & Cap Huston purchased the team for $460,000. Through all of those events and more players flocked to the Ballparks of Florida in the shadow of the orange groves honing their skills under the sun. Much has changed in the way players prepare for the season since those first spring games a century ago. But what has not changed is the promise of the chance to wipe the slate clean each spring and start the season fresh. A century from now if the Earth is still spinning and as long as “climate change” hasn’t flooded the state, there likely still will be Spring Training games in Florida. The Ballparks will likely all have corporate names by then and perhaps the players will be wearing personal jetpacks to get around the bases by then but for the most part it will still be a relaxing way to spend an afternoon in the sun watching the National Pastime. Now if you’ll excuse me, I have some baseball to watch. For those of you living under a rock, or perhaps more appropriately under a blarney stone, today is St. Patrick’s Day. St. Patrick’s Day is named after Saint Patrick, one of the patron saints of Ireland. The actual origin story and legends surrounding St. Patrick are varied and tend to depend greatly on the source material one looks at. There is of course the legend about St. Patrick driving all of the snakes out of Ireland. However, most scholars and scientists agree that there is no evidence in the historic or fossil record of snakes ever being in Ireland to begin with so the likelihood of a single man driving them all off of the island is highly improbable. Before he was Bond, James Bond, Sean Connery was chasing after pots of gold in a movie that has become a much see around St. Patrick’s Day. 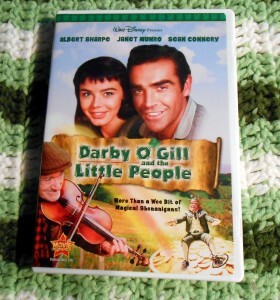 I guess now is also a good time to mention that despite Walt Disney’s assurances and “documentary” techniques King Brian and Darby O’Gill also didn’t really exist despite assertions to the contrary made in Darby O’Gill and the Little People. What is agreed upon is that St. Patrick was born in England in the late 4th century A.D. and was kidnapped as a child and brought to Ireland. He escaped his captors after six years and returned to Ireland as a missionary combining Irish pagan beliefs with Christian sacrament while devising the Celtic Cross. In the centuries that have followed St. Patrick’s Day has been less about the man and more about green clothes, green beer, green hats and pretty much anything else green. Today rivers and lakes around the globe will turn green not from algae but from food coloring poured in by the gallon full as a celebration of the holiday. Massive amounts of corned beef and cabbage will also be consumed as a way to celebrate the day. Over the past couple of years the green movement has moved to the fields of Major League Baseball as well. No, I am not talking about the grass on the fields. I am not even talking about the number of teams who are now encouraging recycling and other “green initiatives” inside their ballparks. What I am talking about is the green that is popping up on the players. 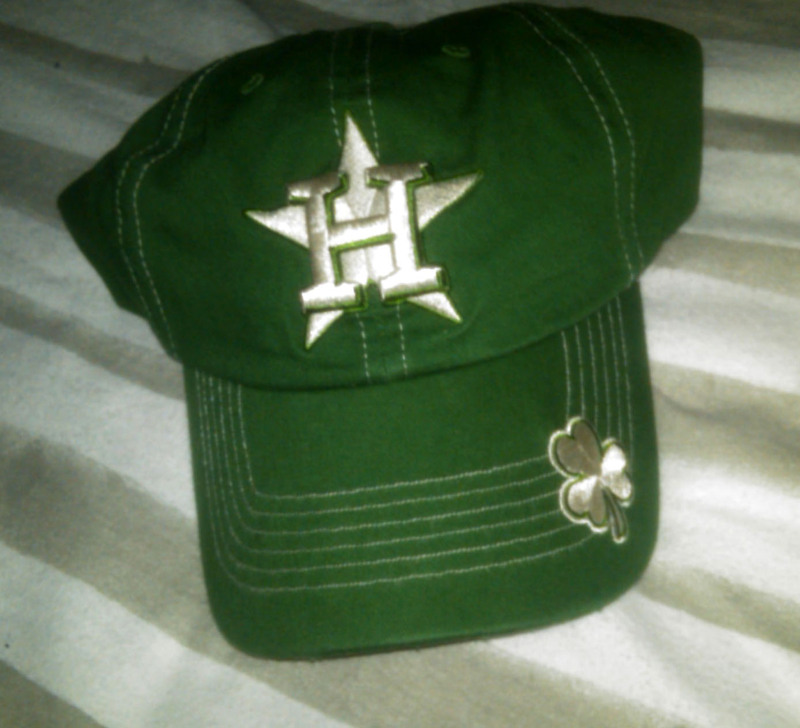 For the past few years the Spring Training games on St. Patrick’s Day have included teams wearing green uniforms and hats. Spring Training games will be a bit greener today as various teams get in the spirit with green hats and uniforms for St. Patrick’s Day. The first team that I recall, going green was the Boston Red Sox. The green uniforms and hats seemed an obvious choice based on the amount of Irish American fans in the Boston area. Other teams followed the green trend and soon it became a league wide tradition as part of the day where everyone can claim to be a little Irish. The teams that go green each year vary with some teams forgoing the green for their more traditional colors. The first time I saw a televised game with the Red Sox wearing the green uniforms I actually thought there was something wrong with my televisions set since the sight of teams in colors other than their normal ones can take some getting used to. The full circle marketing of St. Patrick’s Day to include green items for the fans was just a matter of time since Major League Baseball, like most successful businesses, has made a habit of capitalizing on every opportunity to make money. Don Zimmer (far right) is a special adviser to Joe Maddon and the Tampa Bay Rays and is not to be mistaken for a leprechaun despite what one might think from seeing the Zim Bear giveaway item last year. While the green gear is popular with the fans it also allows the players to try something new in Spring Training. There are special uniform nights throughout the season but green uniform day is the only one that falls during Spring Training. So as a public service announcement next time March 17th rolls around do not adjust your set when you are watching that Spring Training game. Your eyes are not playing tricks on you and the players really are wearing green. Now if you happen to see a leprechaun at the ballpark and ask to see his pot of gold odds are it is just Special Adviser to the Tampa Bay Rays Don Zimmer. Now if you’ll excuse me all of this talk about green things has me in the mood for some green eggs and ham. Editor’s Note: In the spirit of counting down to the start of the Major League Baseball season over the past two weeks we here at Triple B have presented our completely subjective ranking of the Top 10 Baseball Movies. Today we look at number 2 on the list. Our last movie on the countdown, Major League, was about humor pure and simple. Today as we inch closer to revealing the number one movie on the countdown we switch from humor back to more serious subject matter with an added hint of the supernatural rolled in. 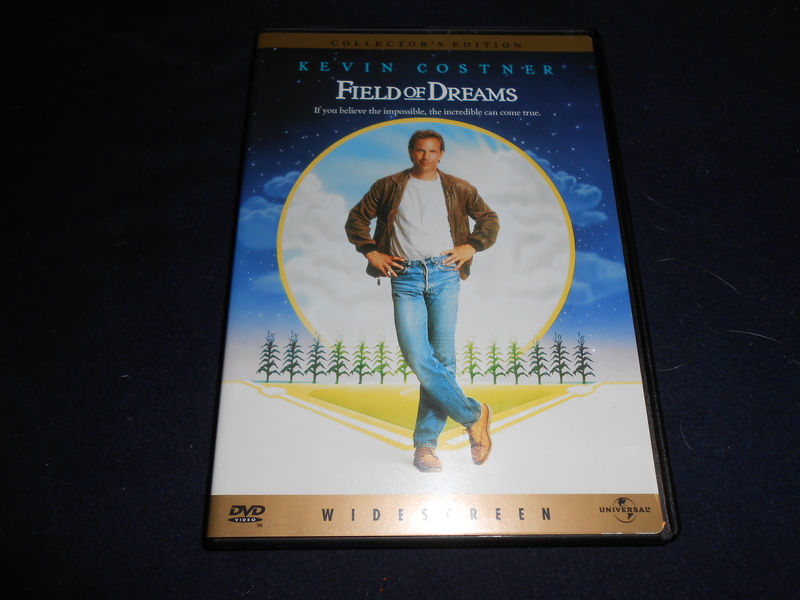 Field of Dreams was Kevin Costner’s second baseball related movie and will celebrate its 25th anniversary on April 21, this year. The number 2 movie on the Triple B totally subjective top 10 countdown of baseball movies is Field of Dreams starring Kevin Costner. Following the exploits of an Iowa farmer who hears voices that tell him to plow over his crop of corn and build a baseball diamond to allow the ghost of Shoeless Joe Jackson and his friends to play on it, the movie deals with second chances and following one’s heart which is a central theme of many of the movies on our countdown. With superb performances from James Earl Jones, Burt Lancaster, and Ray Liotta rounding out the cast, the film delves into topics of faith and belief in both a simpler time in baseball as well as each of us. If you have not already done so, you should “go the distance” and add Field of Dreams to your movie viewing habits. As for the actual field used in the movie, it is still set up for visitors. Plans were even announced to have a professional baseball team play at the complex. There are questions as to whether that will happen but regardless of whether or not professional baseball comes to the Iowa corn field, fans of the movie will continue to make their way to the hallowed ground from the film that sparked their memories of summer days gone by. Editor’s Note: In the spirit of counting down to the start of the Major League Baseball season over the next two weeks we here at Triple B will present our completely subjective ranking of the Top 10 Baseball Movies. Today we look at number 3 on the list. Sometimes a baseball movie should just be about pure unadulterated humor. Yes, baseball is big business but it is also still a game and games are meant to be fun. Coming in at number 3 on the Triple B Top 10 Baseball Movies list is Major League the story of a rag tag group of players uniting for a common goal against a common enemy in their team owner. The number 3 movie on the Triple B totally subjective top 10 countdown of baseball movies is Major League starring Charlie Sheen. For the strict humor baseball movies it is hard to top Major League. Add to the equation that Charlie “Tiger Blood” Sheen did all of his own pitching in the film and you have the makings of a cinematic classic. The movie follows the Cleveland Indians as they are in rebuilding mode following the death of their long-time owner. The late owner’s widow has a plan to move the team from Cleveland to Miami. The catch in that plan is that they have to be the worst team in baseball in order to get out of their stadium lease. To accomplish this goal the owner invites the worst players she can find to the team thinking that it will be a slam dunk to be so bad that a move to Miami can occur. 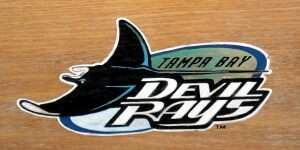 Of course at the time that the move came out the Marlins and Rays were not yet playing so the idea of moving a team to Florida was somewhat new and in the years that followed several teams used a move to Florida as a bargaining chip to get a better stadium deal back home. In the end the players learn of the plot and in true underdog fashion they find a way to make it to the playoffs despite the strong odds against them. In addition to Charlie Sheen as Rick “Wild Thing” Vaughn the movie includes performances by Dennis “That Allstate Insurance guy” Haysbert, Wesley Snipes, Rene Russo, Tom Berenger, and most notably Bob “Just a bit outside” Uecker. Uecker’s performance as the Indians play by play announcer, Harry Doyle, introduced so many quotable moments that they are forever etched in the lexicon of many fans of both the movie and baseball. Of course a particularly rough outing from a pitcher with control issues can lead to uttering, “ball eight,” as well. While I am sure that Uecker’s real life calls of the Milwaukee Brewers are not quite as over the top as his performance in Major League I have often wanted to hear him call a Brewers game just to be sure. Baseball movies throughout the years have included great performances by real announcers that are able to let loose and play a slightly funnier version of themselves and Uecker definitely used every second of screen time to his advantage. 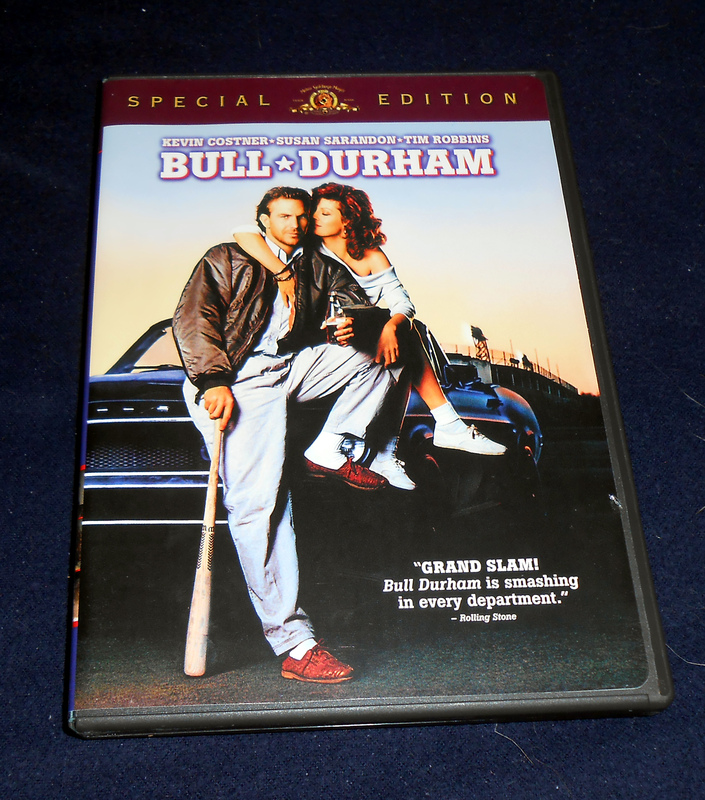 Major League begat two sequels that while not quite as funny as the original are certainly worth viewing as well. There are even some rumors floating around of another sequel with the original cast returning but one really wonders how much comedic gas they could have left in the tank although I certainly could go for some more calls from Harry Doyle and am also curious to see if Charlie Sheen can still bring the heat. Editor’s Note: In the spirit of counting down to the start of the Major League Baseball season over the next two weeks we here at Triple B will present our completely subjective ranking of the Top 10 Baseball Movies. Today we look at number 4 on the list. Today we return to the world of real events captured on film as part of our journey to what Triple B feels is the best baseball movie of all time. While there is certainly no shortage of baseball movies about real people, the quest for a second chance often rings throughout the narrative of many of these movies. 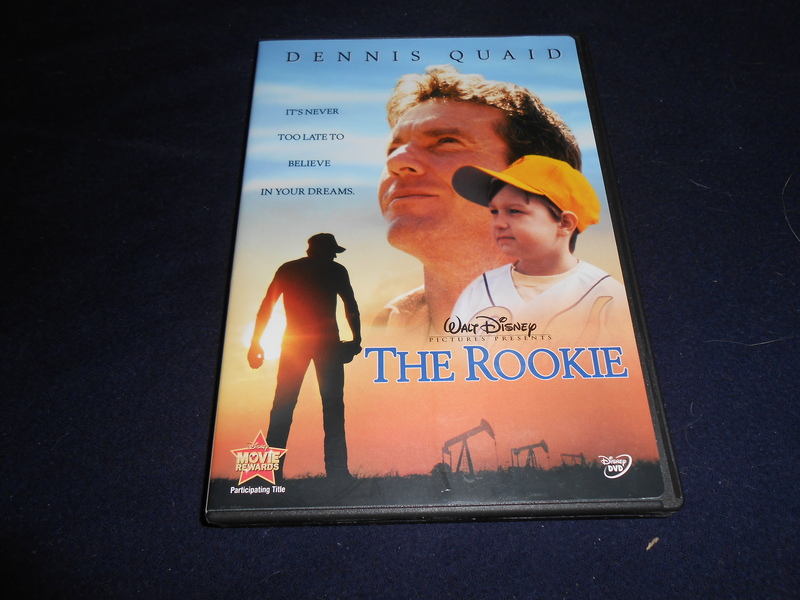 The number 4 movie on the Triple B totally subjective top 10 countdown of baseball movies is The Rookie starring Dennis Quaid. Coming in at number 4 on the Triple B Top 10 Baseball Movies list is The Rookie which tells the true life tale of a high school baseball coach getting to live out his dream of pitching in the big leagues after he thought that his dream had been shattered following an injury. For those who may not be aware of that particular film it follows the real-life story of a Texas high school baseball coach turned relief pitcher for the Tampa Bay Devil Rays. The movie and real life story of Jim Morris show that it is never too late for one to chase their dreams, which is an important lesson for everyone to keep in mind and is what makes The Rookie the number 4 movie on our countdown.